Introducing GM Larry Christiansen's new Tactic Handbook. In this new series of instructional videos, Larry guides us through the most important concepts and ideas about tactic in chess: how to attack the enemy king, recognizable attacking patterns, rook lifts, pins, sacrifices, and all the needed knowledge to become a fearless barricade stormer! 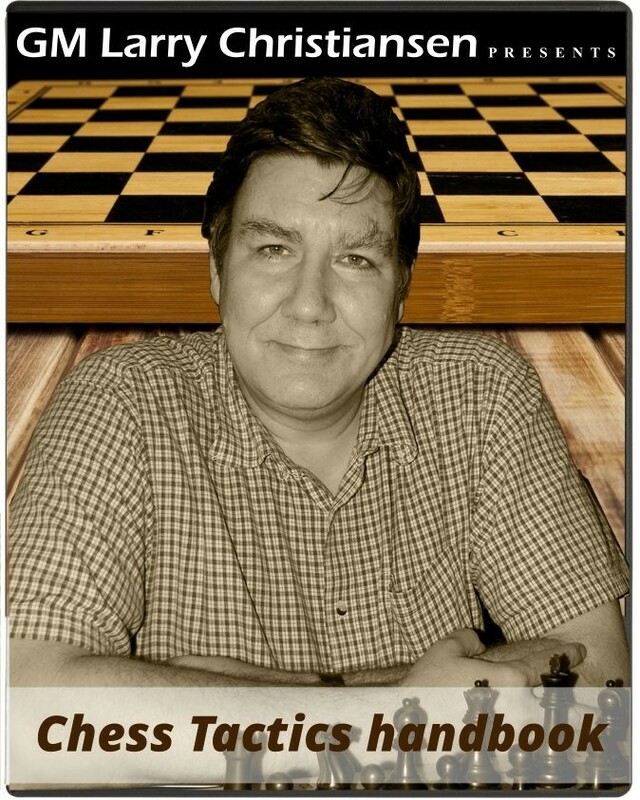 Larry guides us through the most important concepts and ideas about tactic in chess: how to attack the enemy king, recognizable attacking patterns, rook lifts, pins, sacrifices, and all the needed knowledge to become a fearless barricade stormer! In this first episode, GM Christiansen uses examples taken games played in different eras of our game, to show the ideas that lie behind an attacking plan and how they get more and more complicated in modern times. Don't miss the new series presented to you by one of the most important and amazing analysts out there. It will help you improve your "tactic sense", a "feature" that every chess player has to master and cultivate to become a successful and brilliant attacker. The series is aimed at players whose rating ranges from 1400 to 2000, but any chess lover can enjoy and learn from these videos. In the second episode of his Tactics Handbook, GM Larry Christiansen guides us, by using several brilliant examples, to understand how to attack the weakened castled king. Two bishop sacrifice and rook lift is the main topic of this interesting and formative episode. As always, pattern recognition is fundamental to become decent tacticians, and Larry shows us how to spot the right moment to unleash the fatal attack. Of course, such strong and forceful attacks need the right preparation, high mobility of our forces and that "tactical sense" which our GM helps up develop with this amazing course. Enjoy! The pawns on g2 and g7 are two important soldiers, which guard their Sire very closely. In this episode of his Tactics Handbook, GM Larry Christiansen shows us how these two little but valiant warriors can become the target of the enemy attack, especially by the powerful rooks. Sacrificing a rook on g2/g7 is one of the most important attacking themes, and in this video Larry takes us on a rollercoaster journey with a lot of brilliant examples played by great players, who have used this tactical motif to destroy the enemy's king defense and unleash furious attacks. In this fourth episode of his new series, GM Larry Christiansen recaps what he's been teaching us in the first three videos. With several brilliant examples, out tactician master shows us how to apply all the principles that make the attack strong and powerful: centralization of the pieces, attack on f7/f2, rook lifts, attacking strategy and, above all, pattern recognition. Recognizing the exact moment when unleashing the attack is one of the most important things to know for a tactical player. Following this course, which is aimed at players whose ratings is 1400-1500 up to 2000, will provide you with new knowledge and idea to develop into a barricade stormer! There are very good reasons to keep your king out of the center. It becomes a fat sitting duck, an easy target for the enemy's army. After showing us how to attack the castled king, now GM Christiansen moves on to explain how to attack and execute a king that wasn't able to castle. With several examples, taken from games played by the like of Tal and Carlsen, but also unknown masters, Larry, with his unmistakable style, in this episode gives us an introduction about what can happen to the king stuck in the center. In the next episodes of this series, Larry will show how a king in the center is vulnerable in open and closed games. More examples on how to exploit the king in the center. The 2016 Chess Olympiad being played in Baku are a source of amazing games, and GM Larry Christiansen today continues with his lessons on attacking the king in the center by using some pearls from the first 5 rounds of the Olympiad. Taking advantage of the enemy king stuck in the center of the board is a form of tactical art, and Larry with this series is instructing us on how to learn this art and achieve great results. Larry continues to analyze games from the Baku Olympiad. Many on the motif of attacking the King in the center.